Purchasing a piece of used equipment can be a smart investment, but sometimes it’s tough to know exactly what you’re getting for the money. If you’re searching on a used equipment site or buying at auction, you might find two comparably sized machines with comparable age and hours — yet one is priced lower. At face value, the lower cost machine might seem like the better investment. But it’s incredibly important to look beyond the initial purchase price to consider the machine’s total cost of ownership (TCO). The costs that go into calculating TCO generally fall into two broad categories — ownership costs and operating costs. While some of the ownership costs can be easily identified before the purchase (e.g., purchase price, taxes, insurance), other ownership and operating costs will require some further estimation based on the specific machine and anticipated use. 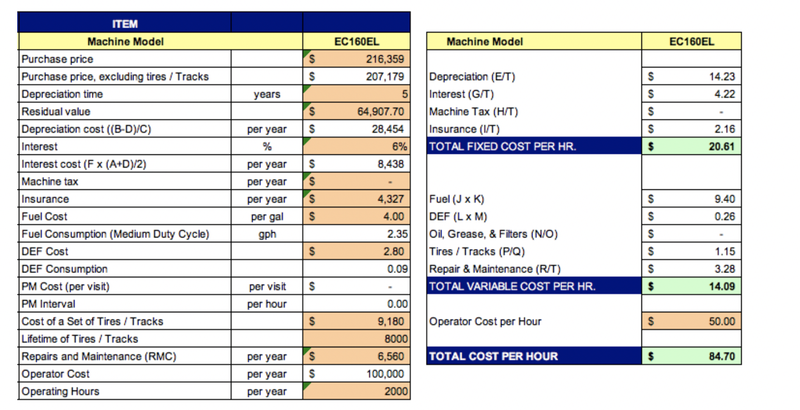 Below is an example outlining some of the key factors in calculating a machine’s estimated TCO, along with a few additional considerations to help the lowest possible TCO. The above image can serve as a general guide to estimating a machine’s total cost per hour. There are 20 rows on the image, and all are important to calculating TCO. I’ve pulled out several of them to discuss more in-depth and included some machine-specific buying tips to consider when making your estimations and selecting a machine. Total purchase price of the machine. Make sure to include all options, delivery and setup costs. The purchase price without tires or tracks. Since the cost of the tires is included in the operating cost, you should remove it from the owning side of the equation. Reduce idle times: One of the best ways to increase residual value throughout your ownership period is to reduce idle times that burn unnecessary hours on the machine. Look for a used machine that has features such as auto engine shutdown and telematics programs that help track machine utilization. Learn how idle times can improve resale value by thousands in this recent blog post. Turn to industry resources: EquipmentWatch is a good resource for researching equipment models that have been identified as the best in the industry for retained value and cost of ownership. For instance, the Volvo EC700 excavator and L180 wheel loader both won the 2018 lowest cost of ownership award, while the L20 wheel loader won the highest retained value award. Here’s the full announcement on Volvo’s EquipmentWatch awards. Interest rate is the rate to be used in calculating cost of capital. When evaluating used equipment, look for seasonal financing deals from OEMs, such as 0% for 24 months on used Volvo Construction Equipment. Fuel consumption: While this can differ by application, the manufacturer should be able to provide model-rated average fuel consumption. For Volvo model-rated levels, visit our fuel efficiency guarantee page. Anticipated life (in hours) of a set of tires or tracks. Check with the seller on how many hours the tires/tracks have on them at the time of purchase in order help estimate remaining life. Ask for an oil analysis in order to better predict expected component life spans. Ask about receiving the complete vehicle history report, such as what is available from a Volvo MATRIS report. Ask about parts availability and any guarantees offered by the manufacturer, such as the Volvo 24-hour parts guarantee. Ask about warranties offered on used equipment, such as the Volvo 8-year, 10-hour extended Tier 4i warranty and the Lifetime Frame and Structure warranty. Ask about machine monitoring and telematics. For instance, Volvo offers ActiveCare Direct® on certified used machines, which can help control your costs in a number of ways. For instance, we recently blogged about how to use ActiveCare Direct to stay on budget. Also, keep the basics in mind when looking at used equipment. Have a mechanic look over the machine before your purchase to make sure all the data points being provided to you are accurate. If you’re buying at auction, check out my recent blog post outlining three tips for buying used construction equipment at auction. 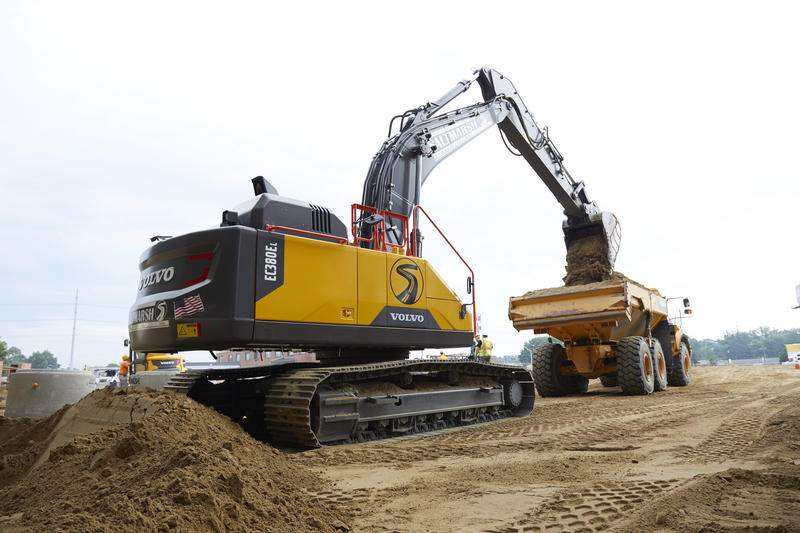 If you’re browsing equipment online, Volvo has a few options to help you find the right machine. Check out our Volvo used equipment listings, sign up for our remarketing e-newsletter to have listings sent directly to your inbox, or call us directly (1-866-537-6094) if you want to talk through what you’re looking for. We are here to help! Disclaimer: Volvo Construction Equipment (“Volvo CE”) hereby disclaims any and all expressed or implied warranties regarding the cost data, the calculations contained therein, or the appropriateness of equipment used in analysis, without limitation, any warranties of merchantability or fitness for a particular purpose. In no event shall Volvo CE be liable to the entity for whom the report was created (or any other entity) for any indirect, incidental, consequential, or special damages, including without limitation, lost revenues or profits. The values in the tan cells are to be changed according to your scenario.